Welcome back! We hope you all had a fabulous summer! New student cards will be coming (now that pictures have been taken), however don’t wait for your new card to arrive. You can still take out books without a card, so come and take a look at what is here in the Library Learning Commons. We have a wide variety of fiction, non-fiction, graphic and popular non-fiction, so we are sure you will find something that is a good fit! The Vancouver Public Library has a site dedicated to you. Find book recommendations, upcoming events, and volunteer opportunities to bank service hours. Check out new materials, popular series titles, book suggestions, reviews, and more. Be the first to read and review teen books before they’re released! Visit the Champlain Heights, Dunbar, Hastings, or Oakridge branch. Sign out and read a book from the Teens Read It First shelf. Rate it out of five stars and write a review (under 250 words). Submit ratings and reviews to teens@vpl.ca to get one community service hour for every 100 pages of the book! May reading take you to many amazing places this summer; see you in September! Want to draw comics this summer? Want to be a part of history? Cedar Cottage Neighbourhood House is working on a community-based history project that needs your involvement! How? Join the heart of the project in July & August – take part in weekly summer comics workshop for youth! The aim of the project is to get community members like yourself engaged in your own history, and the history of this place. During the workshops, you’ll learn how to create comic-narratives based on your own experiences, archival materials, and interviews with people in the community. Participants will meet up once a week for 2-3 hours during July and August – time of day to be decided on by the group. The comics you create will be displayed to help other community members see and learn about the history of our neighbourhood. To view the posters with more info click HERE and HERE! The library is in the process of checking our collection and shutting down for the school year. In September, the library will be using a new computer system, so we are trying to clean up all of the lost & missing items before transferring over the collection. 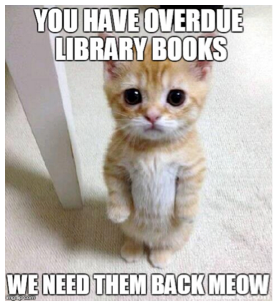 Students — please return all library books by May 31st! If you have overdue books or fines on lost books, we will not issue your yearbook (if you purchased one) until you come to speak with Ms. Fletcher or Mr. Jakoy. Staff — please return all library books by May 31st! If it is a resource you still need at the start of June, then please return it as soon as you’re done with it. If you would like to borrow items for summer school or planning, please speak with Ms. Fletcher or Mr. Jakoy. Murder Mystery in the Library Learning Commons! The picture below shows a group of Gladstone students trying to solve the murder of Svetlana Mirova, a brilliant yet difficult to get along with scientist who was working on “The Effect of Bromine in Influencing Cell Membrane Signaling in E-Coli” at the time of her death. Come on into the Library Learning Commons to see if you can figure out who did it! Human Library is coming to Gladstone! On February 15, Gladstone Library Learning Commons will be hosting its 5th Human Library. Human Library started in Copenhagen around 15 years ago, with the intent of challenging stereotypes and prejudices through the process of readers “reading” or talking to human “books”. Over the years at Gladstone, students have had the opportunity to meet and talk with many human books, such as a mortician, radiologist, police officer, ghost-hunter, visually impaired (and her guide dog! ), and more. Everyone has a story to share. We look forward to reading the books that are coming on the 15th! OWLs in the Learning Commons! Today we had some very special visitors in the Learning Commons from O.W.L. : The Orphaned Wildlife Rehabilitation Society based out of Delta, BC. Biology 11 students had the opportunity to learn about and see up close an American Kestrel and a Barn Owl. Thanks O.W.L. for coming in and sharing with students about what the O.W.L. Society does, as well as basic owl biology and behavior, sizes and types of owls, the dangers they experience, and much more. The books below are chilling waiting for someone to come and check them out! Literally! This summer Mr. Jakoy visited the Klementium Library in Prague. This picture is from a blog called Meet the Slavs. Read more about this library with a fascinating astronomical history. The Library Learning Commons at Gladstone will be open as of Wednesday, September 7, to sign out books. Come on in to take a look at what we have!